You don’t have to undergo an entire overhaul of your skincare routine or lifestyle to deal with breakouts this summer when just a few quick and easy adjustments to your existing plan can work just fine, and probably stick with you in the long run! Acne doesn't appear overnight, and unfortunately, it can’t be treated that way either, so before you begin ridding your skin of blemishes it’s important to understand just how this condition affects the body, and skin. Acne is attributed to a hormonal imbalance, which can affect the function of the sebaceous glands, whose job it is to create sebum, or oil. This oil travels along the pore to hydrate and protect the skin on the surface. When too much sebum becomes clogged within a pore and pairs with dead skin cells from the surface, bacteria forms, triggering an inflammatory response from the body. This process is known as the acne cascade, and usually results in red, swollen bumps known as pimples, a symptom of acne. While excess oil certainly needs to be kept under control, stripping the skin of too much can result in dry, flaky skin, which can lead to acne by contributing to the formation of bacteria. This rings especially true in the summer months, when temps run hot and sun can zap moisture from the complexion Not only can this leave you looking and feeling dried out, it can prove particularly harmful to acne-prone skin by triggering increased oil production, which can lead to clogged pores, or even result in prolonged scarring of existing breakouts or marks. 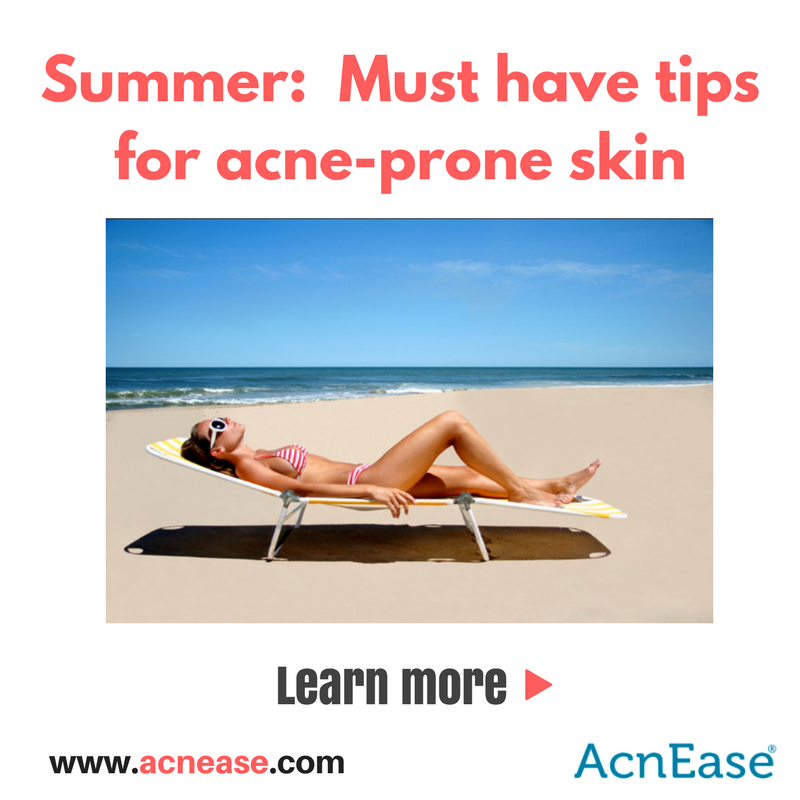 If you have acne, don’t worry - you don’t have to skip out on fun in the sun this summer. Just try implementing any or all of the tips listed below to help keep your complexion in top form. Carry a water bottle. This one sounds like a no-brainer, but just because it’s easy doesn’t mean it isn’t effective. By hydrating from within, you can hydrate and plump skin cells, which can appear to fill in any lines, wrinkles, or even light pock marks or pitting. Because water increases circulation and blood flow, hydration also aids in proper kidney function, which works to flush impurities from the body, ultimately resulting in the ‘rosy glow’ associated with healthy skin. Wear sunscreen. This should be a daily do for everyone, and if you’ve got acne to contend with, this is a non-negotiable. While natural light does contain essential D vitamins, and can be enjoyed in small doses, too much of those strong UV rays can lead to sunburn, dehydration, hyperpigmentation, permanent scarring, and even skin cancer. With plenty of acne-friendly SPFs on the market these days, there’s no excuse to miss this one -- your skin, and health, will thank you for it. Just make sure you use a sunscreen with the main ingredient being zinc. Very important! Stick to non-comedogenic makeup formulas. All makeup-wearers should be familiar with the terms non-comedogenic, paraben-free, sulfate-free, and oil-free, especially anyone with acne. Makeup can be worn during the summer months, but it may take a little switching up from fall, winter, or even Springtime formulas to prevent clogged pores (and runny looks.) Applying with a light hand will be your best bet this summer, as will the use of a primer before applying foundation, concealer, or heavy powders. Exfoliate with ease. Removing dead skin cells from the surface of your complexion is a must-do for keeping pores clean, but those gritty formulas you may have relied on to get you through the winter may be a little too harsh for sun-kissed summer skin. Sticking to gentler formulas, such as a gel or enzyme-based variety can make a major improvement in your exfoliation game, or you can create your own gentle exfoliant by mixing beta carotene-rich apple cider vinegar with naturally exfoliating baking soda. Simply mix equal parts ACV and baking soda until a paste-like consistency is formed. Apply to affected areas of the skin, and rinse away with warm water after about 15-20 minutes, patting the skin dry with a clean towel. Make your snacks work for you! Summertime usually has people on the go, doing more outdoor activities while the weather is nice and warm enough to permit it. Oftentimes, when we’re running around, our nutrition can fall to the wayside, but certain snacks can not only fill us up, but work with our skin type. Keeping anti-inflammatory snacks on hand throughout the day can keep us hydrated on those hot, active afternoons, and also assist with curbing the inflammatory response of the body that happens when harmful bacteria forms within a clogged pore. Easy options include berries of all kinds, cherry tomatoes, nuts, and green juice, or any snack containing leafy green veggies. Easy changes that can have a positive impact on acne-prone skin for the summer, but in order to truly treat acne, you’ll need to address the root cause - over-productive sebaceous glands. Staying smart about what we’re putting in, and on, our bodies and skin is a skincare step that should never be skipped, but real change occurs from within, and requires a systemic solution if you want to achieve real, lasting results. Luckily, our AcnEase® users are able to have total peace of mind and the opportunity to get the best complexion possible. Why? Because they are on a treatment that actively works from the inside 24/7 to get rid of their acne naturally and with zero side-effects. The herbal ingredients used work to effectively create a barrier between the hormones and the sebaceous glands, ensuring that only the amount of sebum needed to protect and hydrate the skin is being produced, making for a gentle treatment that delivers real, long-lasting results, regardless of the severity of your acne symptoms, including breakouts that appear on the body. We want to hear from you! Do you have any changes you make to your routine once summer arrives? Have any easy tips to share with our readers? Tell us in the comments!